Villid the Tyran is on a quest to bring all the people of Theldiniya together to face the threat of the Drakma and the Red Lands. Separated from his pregnant lover, Aya the Elf, he hopes to complete his mission to the Vryna and the Dwarves, to recruit their people for the cause. But the Vryna and the Dwarves have their own problems. Villid will have to prove himself in the arena. With the aid of Pearla and Stenn, a Vryna and Dwarf, he will have to show the warring races who their true enemy is. While Villid is away, his lover is in danger. She carries a child of two different bloods, a child that could fulfill a dark prophecy. And the Drakma knows it. Villid will have to face tough decisions to protect Theldiniya and the elf he loves. Blood of the Innocent is a great follow up to Blood of the Fallen. Reid raises the stakes in this story, building on the plot with plenty of new twists to reveal. New characters are introduced and the story rushes forward, keeping you turning the page. If you’re a fan of Fantasy, the Blood Scroll series is a great adventure. The ending kept me on the edge of my seat and I am eagerly awaiting the final book to read how this all ends. 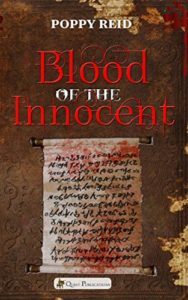 You can by Blood of the Innocent from Amazon!